They also assessed the participants' usage of social media—including Twitter, Facebook, Instagram and Snapchat—during that same period. "There have been suggestions of links between narcissism and the use of visual postings on social media, such as Facebook, but, until this study, it was not known if narcissists use this form of social media more, or whether using such platforms is associated with the subsequent growth in narcissism. "The results of this study suggest that both occur, but show that posting selfies can increase narcissism. 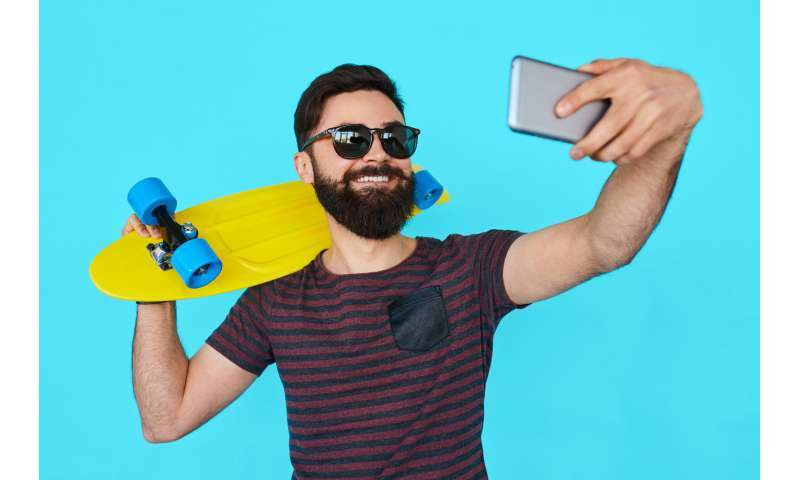 "Taking our sample as representative of the population, which there is no reason to doubt, this means that about 20% of people may be at risk of developing such narcissistic traits associated with their excessive visual social media use. "That the predominant usage of social media for the participants was visual, mainly through Facebook, suggests the growth of this personality problem could be seen increasingly more often, unless we recognise the dangers in this form of communication." "The use of visual social media may emphasise the perception of narcissistic individuals that they are the main focus of attention. "The lack of immediate 'direct' social censure, may offer them the opportunity to inflict aspects of their narcissistic personality, present themselves in a grandiose manner, and realise fantasies of omnipotence."